Fall is officially here, HELLO FALL! And while I am ready for all things sweaters, boots, soups, crock pots, I still have an abundance of tomatoes and cucumbers. So before I wash my hands of summer and all of its bounty, here is a filling salad that will help you eat your way through all of those leftover tomatoes. This recipe is adapted, vert slightly, from Bon Appetit. And although I just made this recipe about 2 weeks ago, I have made it 4 times since. 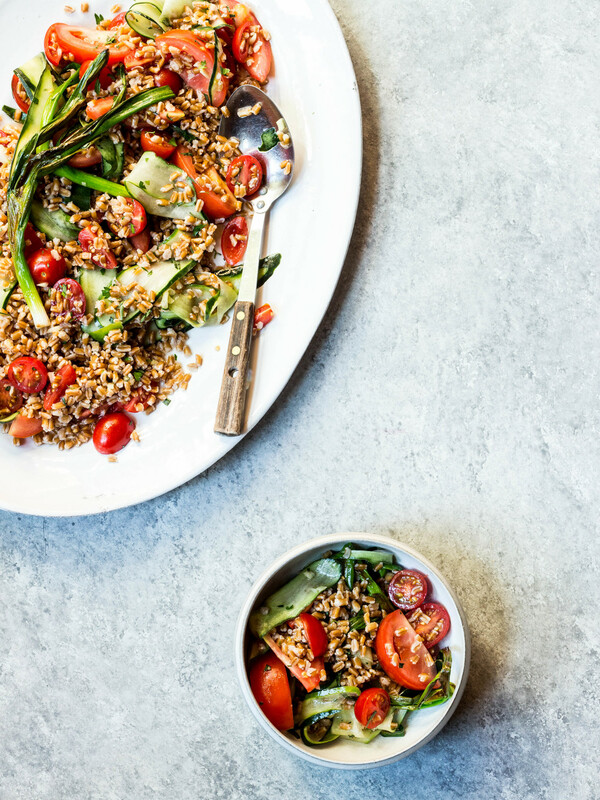 We eat a variety of grain salads throughout the week, and I am always looking for new ways to use fish sauce, it's really the perfect secret ingredient. My favorite, on roasted brussel sprouts! So before we say goodbye to summer, make this salad, drink some wine, and enjoy. Whisk together garlic, fish sauce, 1 tablespoon vinegar and sugar. Add 1 tablespoon of water. Taste. Add additional tablespoon of vinegar if needed. Cover and chill. In a medium pot, add farro and cover with water. Bring to a boil and cook for 20 minutes until tender. Drain and set aside in a large bowl to cool. In a large skillet add olive oil over medium-high. Cook scallions, and char on all sides, about 4-6 minutes. Add tomatoes, cucumbers, charred scallions, parsley, and tarragon to cooked farrow. Toss together. Add vinaigrette, toss, season with pinch of salt and pepper, and toss again.